"Hell Wants Him, Heaven Won't Take Him, Earth Needs Him." Religious views from a different angle, romance that shouldn't happen, drama that leaves you in suspense and action packed in every corner. These are some of the things this amazing movie has to offer to its viewers. 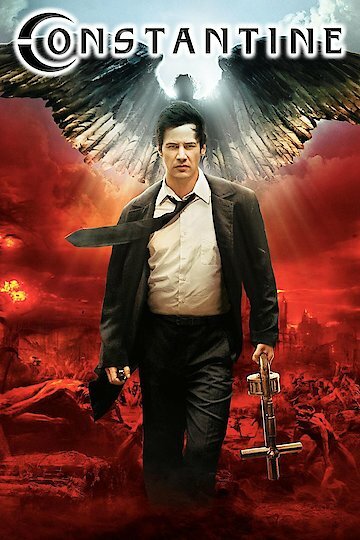 As the film starts the viewer sees that Constantine is an exorcist that uses not only prayer but also his fist to exorcise the demons out of the customers. The viewer sees that Constantine attempts with all his might to also fight his inner demons so he can redeem himself for his past actions. The viewer learns how far Constantine is willing to go to protect his friends even to the extent of sacrificing his own life for theirs. As the film continues the viewer sees how an easy misconception can go as far as to cause someone to commit suicide because they feel they don’t fit in. The viewer learns to listen to people and try to understand what they are trying to say and not go as far as to automatically judge someone just because of what they say they are seeing. The viewer learns how religious views affect every day perspective and the film brakes the barrier between real and unreal by showing the viewer the effects heaven and hell can have on earth. The film also shows the viewer how a person attempts to deal with her twin sister’s death by understanding the reasons of her suicide. The film shows us a parallel reality only so many people can see with a very deep philosophy on what is good and what is evil and goes to farther extents of showing us that they need each other to coexist. The film has astonishing special effects that truly help twist the reality of the story-line and give a new twist to possible frightening experiences. This film is recommended for adults but kids can enjoy it if they are supervised by a responsible adult. This film combines all genera into an explosive film that will blow the mind of the viewer and leave wanting for more as they follow Constantine in his attempt to redeem himself and save his friends. This movie is especially good if you want to see a religious action film. Constantine is currently available to watch and stream, buy on demand at Amazon, Vudu, Google Play, iTunes, YouTube VOD online.